The University of Groningen (Dutch: Rijksuniversiteit Groningen), located in the city of Groningen, was founded in 1614. It is the second oldest and third largest university in the Netherlands. Since its inception more than 100,000 students have graduated. It is a member of the Coimbra Group. The University of Groningen has 9 faculties, 9 Graduate Schools, 27 research centres and institutes, and more than 175 degree program. 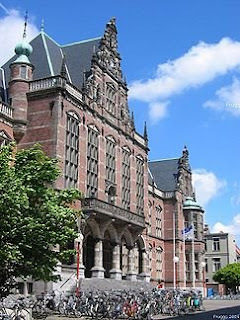 Founded in 1614, the University of Groningen is the second oldest university in the Netherlands. The University of Groningen enjoys an international reputation as one of the leading research universities in Europe. It has a large international network and an excellent reputation for academic teaching with a modern, student-oriented approach. We offer degree programmes at Bachelor’s, Master’s and PhD levels in virtually every field, many of them completely taught in English. Located in the north of the Netherlands, Groningen is an ideal, safe student city with a flourishing student life and many social and cultural activities. International students have rated the University of Groningen as the most welcoming university in the Netherlands. The founding of the University in 1614 – at that time still a college of higher education – was an initiative taken by the Regional Assembly of the city of Groningen and the Ommelanden, or surrounding region. There were four faculties – Theology, Law, Medicine and Philosophy. The first 75 years of its existence were very fruitful for the University with about 100 students enrolling every year. Almost half of the students and lecturers came from outside the Netherlands – the first Rector Magnificus, Ubbo Emmius, came from East Frisia in modern day Germany, for instance – but at the same time there was already a close relationship between the University and the city and the surrounding region. Opportunities and threats followed on each other’s heels during the nineteenth century. In 1815, at the same time as Leiden and Utrecht, the University gained recognition as a national college of higher education, but this was followed by discussions about closure. The situation improved markedly when a new main university building, the Academiegebouw, was constructed in 1850, a building that was largely financed by the people of Groningen. This made the fire that completely destroyed this building in 1906 even more poignant. In the meantime, the Higher Education Act of 1876 had radically improved the position of the University, which was renamed the "Rijksuniversiteit Groningen" (RUG). Teaching now took place in Dutch as well as in Latin and the University was given a research as well as an educational duty. This laid the foundations for the present research university. The University of Groningen developed apace during the first decades of the twentieth century. The number of faculties and courses grew steadily while the number of students showed an explosive growth. When the University celebrated its first 300 years in 1914 there were 611 registered students; this had already grown to 1000 by 1924. After a drop back during the Depression, and in particular during the Second World War, the number of students grew rapidly from 1945 to reach 20,000 in 1994. At the present time there are about 23,000 students registered at the University of Groningen with the number of foreign students again growing steadily, and following the tradition set by the first Rector Magnificus, the number of German students and researchers has grown strongly in recent years.